This is a book dedicated to view indicators. It is an intriguing book that very much grows on you. We have all seen view indicators. There is a well-known indicator on Lochnagar, supplied by the Cairngorm Club. On clear days, it's a pleasure to look across the landscape and check that you've got it right. On murky, cloudy days, it's a pleasure to know for sure that you're on the right tor! 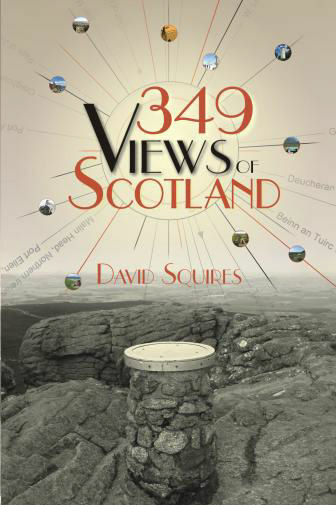 349 Views of Scotland is a listing of all such indicators across the country and is the first full-length work on the subject. It starts from the series of articles written by Ben Humble in 1938 for the Glasgow Evening Times. Humble visited most of these indicators and wrote of his experiences, sometimes rather desperate due to the weather. David Squires has taken this list and updated and added to it. The author adopts an understated style, for example, the comment made on the indicator at Rannoch Station, "extended study of the disc is facilitated by a visit outside the midge season". We can all imagine the problem at such a location. However, the emphasis is on facts rather than description. There is a good selection of photographs, the best of which are the old ones and the postcard copies. This is not a book to be read from cover to cover. It is a source of information, somewhere to go to check out a detail, to learn more about the indicator that you stopped at earlier in the day. Having said that, it's full of fascinating snippets of information. Did you know about the indicator of the view of St. Kilda from North Uist? OK, it's long way from North Uist and won't be visible on many days in the year, but it's a nice thought. Although, the citizens of North Uist are unlikely to appreciate being lumped in as part of Inverness-shire! I know that the postcode decrees this, but North Uist is a very long way from Inverness both geographically and culturally. What about the view indicator at Sullom Voe Oil Terminal to mark the export of the five billionth barrel of oil? Given the gloom in the industry right now, the halcyon days to which this indicator refers seem a very long time ago. A reminder of better days. Another reminder of times long ago is the reference to the indicator on Dundee Law being removed during the war because it might have helped the Germans should they have invaded. We have all heard of the removal of signposts; view indicators as well! We can only imagine a column of German tanks stopped in Dundee, unable to proceed any further, because they had forgotten their maps and all signs and indicators had been removed! I must admit to be rather surprised by the overall level of inaccuracy of these indicators. Too many either point to features which just aren't visible or point in the wrong direction. Rather naively, in the past, when struggling to make sense of the information on an indicator, I have blamed my own poor attention to detail. I now know to go home and check the book! Not surprisingly, the book encourages the reader to visit some of these indicators, possibly even visiting them all. My initial reaction to this was that we have enough lists of things to "collect" already. Not long ago, I was on the top of a mountain, watching somebody "collect" the trig point, photographing it for the record book and was rather scathing. Do we really need another list? However, as I thought about it, I have changed my opinion. Views are a very important part of enjoying the countryside and we all talk about the views when describing an outing into the hills. Visiting the country's best views is not so eccentric! As I said at the beginning, it's an intriguing book that grows on you. It will trigger some more stops to look at good views, in some cases explain your confusion when comparing your opinion with that of the indicator in front of you and generally add to your knowledge of the Scottish countryside. It will be a useful and pleasurable addition to your shelf.